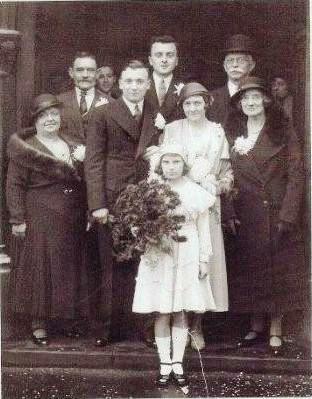 Don and Maureen Harris have provided this photo taken at the wedding of Frederick Harris & Ena Agnes Hutchinson at St. Paul’s Church, Brentford on the 19 Nov 1932. They are the parents of Don Harris. Top row from left - James Henry Hutchinson (Don's Grandfather, Herbert John Harris (Don's uncle, the face behind James's ear), Stanley Harris (Don's uncle), Frederick Harris( Don's Grandfather). Middle row from left - Maria Haywood (sister of Ann Maria Haywood born in Brentford in 1853), Frederick Harris (Don's dad), Ena Agnes Harris nee Hutchinson (Don's mum), Mary Ann Harris (Don's Grandmother). Bridesmaid at the front - Kathleen Day (Don's cousin - daughter of Rosina Anne Hutchinson and Arthur Day). Lynn Hayter adds 'The Hutchinson's mentioned are all descended from Charles James Hutchinson and Ann Maria Haywood and were all born in Brentford'. See also the Hutchinson family page.